Looking for the perfect pair of skinny jeans? 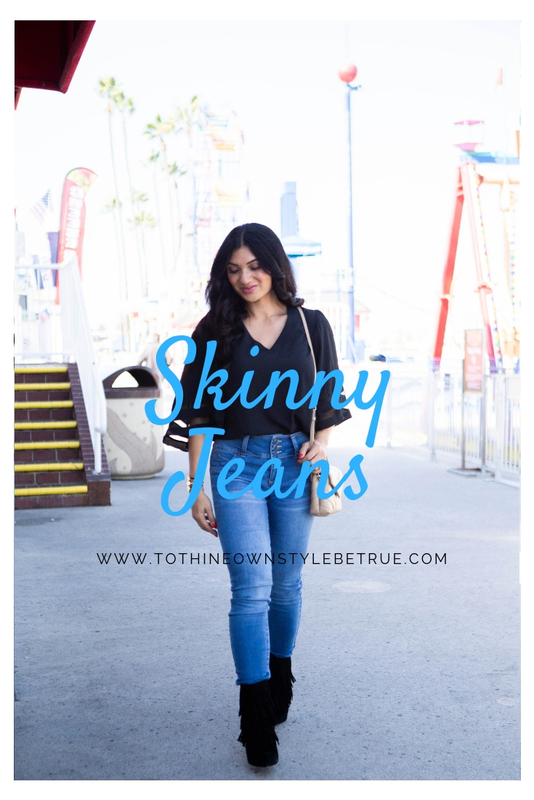 Keep reading as I share the best pair of skinny jeans every woman should own! Photography by The King’s Rose. Happy Tuesday! Wow, it has been some weekend! My family and I were pretty much in bed with the sick bugs. It gave us a chance to spend time together in our pajamas while enjoying a movie marathon all weekend long. My little boy took all of the pillows and blankets in our home and created a comfy pit in our sunken family room for all of us to lounge in. It was actually really fun laying down on the floor together! It is moments like this when you realize that it doesn’t take much to build connections with your loved ones. All you need it time. There was a time when I thought creating bonding memories could only happen when you took a vacation or paid for an attraction to emerge yourselves in. Now, I understand that really the most important criteria in creating lasting memories is fully being present with your loved ones. Letting go of any distractions and focusing on enjoying the present…no bells and whistles are needed! It is really that simple and no planning is needed. I like that very much! Albert has the entire week off and the kids have Thanksgiving Break this week so I am on Cloud 9 with having my family all at home with me. This is all I need. 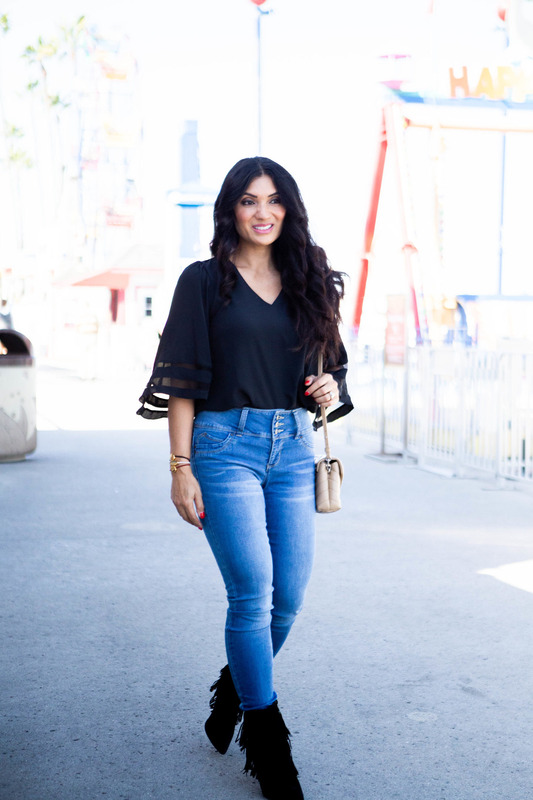 Last week, it was all about my mid-rise bootcut jeans that I love! A lot of you said, you were glad it was coming back in style too! Yay, for that! In the meantime, skinny jeans are here to stay and these ones from Royalty for Me are amazing! I love the 5-pocket construction because the details matter and little compartments to hold lip gloss, change, and keys are a plus! The mid-rise is perfect and looks great with tops that are tucked in or left out. The 3-button detail is just so cute and actually feels more comfortable against the skin than a full zip. And, of course the hyper stretch in this fabric allows me to move in comfort and ease. It hugs my curves perfectly and provides the stretch I need to feel comfortable. Skinny jeans allow me to showcase boots of all kinds and these ones with layers of fringe are so fun to show off! What are your feelings about skinny jeans? Some ladies LOVE them and some can’t stand them at all. Which side are you on? Jeans: c/o Royalty for Me | these ones are a good fit too. Boots: old, similar here and here. I am loving this outfit! Your boots are my favorite and your jeans are rocking! The boots are so much fun and are actually really comfortable (just like the jeans!). Have a great day Deb! Omg, this entire outfit is perfection! I have had my eyes on that bag in the same shade for months; and you wear it so well! Hi Deepti! Thank you so much! This shade is quite unique and I love it a lot! Have a great day! In love with the top of these skinny jeans. Gorgeous styling with that top and booties too. You look fanstastic in those boots and jeans!! I want that $500 gift card hahah! Sorry, but you are too fat and short-legged for skinnies. Too fat and short-legged for skinnies. You look so cute! I love this outfit on you. Loving the wash of those jeans too! Hope you’re all feeling better! ( a movie marathon does sound fun though)These jeans are so cute on you!